Most of the record 5,700 runners of Thursday’s 40th anniversary Alexandria Turkey Trot had a day full of eating Thanksgiving dinner on their minds. But winners Habtamu Arga and Susanna Sullivan were thinking about something else; course records. Each eclipsed the measure on an idyllic Thanksgiving morning through five miles of Alexandria’s Del Ray neighborhood’s flat streets. Temperatures in the low 40s, zero wind and hardly a cloud in the sky helped create a memorable day for many involved. Sullivan, 25, had won the five-mile race each of the last three years and each came down to a kick in the last half mile. “I came ready to fight,” said Sullivan, who finished in 27:11 running under George Buckheit in the Capital Area Runners group. But her closer pursuer was nearly three minutes behind her. [button-red url=”http://www.mocorunning.com/meet.php?meet_id=3296″ target=”_self” position=”left”] Results [/button-red]The Northern Virginia native and George Mason High School graduate is eyeing February’s marathon Olympic trials in Houston and hopes to run close 2 hours and 30 minutes, following a half-marathon tune-up in January. Julie Rotramel, the second overall woman, didn’t expect to finish so high on the podium. She ran a 30:07 in her first five-miler. The weather was “ideal,” the D.C. resident who used to run with Pacers and now with the Big Rig Track Club said. “You didn’t even need gloves,” usually a necessity in late November around Washington. Paige Kvartunas, a Springfield, Va., finished third in 30:45. On the men’s side, Ethiopia’s Arga had his eyes set on a course record, Arga said after the race through his coach and translator. He and teammate Ginrna Gebra finished first and second, well in front on the rest of the pack. Arga finished with a course record of 23:31 and Gebra in 23:48. Gurmessa Kumsa, also from Ethiopia, held the previous course record, running a 23:39 in 2006. Each have grand visions of running for their country in the Olympics, but have their eyes set on a half marathon goal of 59 minutes and marathon goal of 2:05 later this season, their coach said. The fairly generous $600 prize money to the overall male and female winners helped attract the Olympic trial talent, race director Brian Danza said. Men’s third place finisher Tyler Andrews said the Ethiopians broke away from the pack after about a half mile and few, not even Andrews who finished in 24:38, could keep up. Arlington’s Michael Wardian and his Vizsla, Rosie, won the “doggie division” – given to the fastest dog-human tandem – in a time of 28:09. Alexandria’s Matias Palavecino wasn’t far behind in 28:43 to take the stroller division. Even with his dog, Wardian took the masters division, outpacing Scott Anderson, who finished in 28:26. Julia Taylor was the top masters woman in 33:48. The 40th running of the race was also the largest in what has become a Thanksgiving Day staple in Northern Virginia. Finishers complimented the crowded support along the five-mile course, which is run largely through residential neighborhoods, with supporters coming out of their nearby houses to cheer on runners. “In the last week, the weather definitely contributed to the amount of people,” said Danza, a former president of the D.C. Road Runners, the group that organizes the race. 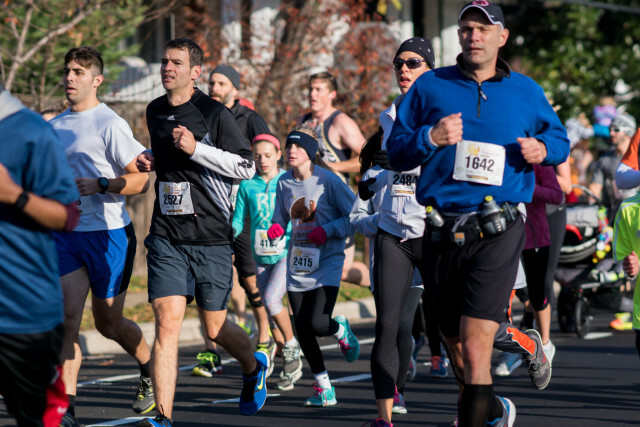 As which most local Thanksgiving Day racers, the Alexandria Turkey Trot had its fair share of racing turkeys and pilgrims. Kristen Currie, who dressed as an axe-wielding pilgrim, ran with friend Adam Siple dressed as a turkey. Siple got the idea from a friend who ran a race as a banana chased by a gorilla. He adopted the concept to a more Thanksgiving theme. The pair finished in 46:03. Woodbridge’s Les Maynard was one of several pilgrims who ran the race, his first Alexandria Turkey Trot. Jim Scott, first time turkey trotter in town from New York to visit his wife’s family, ran the race dressed as Elvis, receiving the unofficial award for first place costumed runner. He finished in 32:09. His wife’s whole family dressed as Elvis, complete with wigs and sunglasses. The Alexandria Turkey Trot supports ALIVE! – short for ALexandrians In Volved Ecumenically – a nonprofit that supports the community’s needy. When the race started in 1975 with less than 250 runners, the entry fee was two cans of food, a requirement that was kept for a number of years. Even without the food-donation for entry fee, the nonprofit received 46 banana boxes of canned food this year, executive director Diane Charles said. ALIVE! also was given $5,000 from the race’s proceeds. In honor of the 40th running of the race, organizers gave $100 to the person wearing the oldest race t-shirt. The winner was Alexandria Sherriff Dana Lawhorne, who had a family member who produced the garb given out at the 1988 race. John Cocker of Arlington came up a few years short, wearing a shirt from the 28th running of the race. He’s ran the race every Thanksgiving since around the year 2000.